What if I told you that the residents of Georgia voted to tax themselves to restore the state’s coastal wetlands? You would probably laugh, right? Well, the residents of the nine-county area of the San Francisco Bay did just that last year. This is no joke, the Bay Area taxed themselves $500 million over the next twenty years to restore massively degraded coastal wetlands and insulate communities from impending sea level rise. The San Francisco Bay Area’s ecological degradation is a story all too common to the United States, however the people of California have opened a new chapter that could guide communities across Florida, Louisiana, Carolinas, and, yes, Georgia. Before I plunge into the history of the Bay Area, let’s get a few things straight about coastal wetlands. According to the EPA, coastal wetlands are areas that experience saturation of saltwater from the ebb and flow of tidal waters. Coastal wetlands are typically located in deltas or estuaries, where freshwater from rivers mix with saltwater from oceans. Coastal wetlands perform a disproportionate amount of ecosystem services including flood protection from storm surges, water quality improvement by filtering out nutrient and certain chemical loads, and prevention of coastline erosion. With the variety of saltwater and freshwater areas, coastal wetlands support a large amount of biodiversity for small plots of land. In just the Bay Area alone, 500 species depend on the coastal wetland habitats for survival including 128 species listed as threatened or endangered. In the southeast and Gulf Coast, coastal wetlands directly support upwards of 50% of commercial fish and shellfish harvests. Coastal wetlands play an out sized, yet unappreciated role in our world. Imagine you are fishing off a beach of the San Francisco Bay. To your left, you witness trucks constantly dumping dirt into the water. To your right, several large pipes are pumping raw sewage into open water. Above you, the sky is empty. It’s 1960’s San Francisco, and the Bay is in serious danger of collapsing ecologically. After the mass urbanization of the Bay Area in the late 1800’s, the government and private businesses began a spree of draining wetlands for agriculture, housing development, and salt ponds. Municipalities, businesses, and private citizens openly dumped trash, oil, and raw sewage into the fragile estuary. In the 1960’s, the Bay itself was shrinking by two square miles by infilling to create even more land for the booming economy. The Clean Water Act of 1972 immediately halted most of the activities destroying the Bay, though before the bay had shrunk by 33% and 75% of coastal wetlands vanished. The extent of the damage to the San Francisco Bay is an all too familiar story in the United States. Fast forward to 2008: the California Legislature set up the San Francisco Bay Restoration Authority to coordinate, fund, and implement restoration projects of the coastal wetlands and aquatic habitats. What was once a bottom-up movement of non-profits and small neighborhood alliances like the San Francisco Joint Venture and Bay Institute, flip flopped to a top-bottom organization. In order to expedite efforts of restoring over 100,000 acres of degraded lands, citizens of the Bay Area passed a $500 million over twenty years tax on themselves! The Restoration Authority, compared to small non-profits, produced comprehensive restoration management plans, coordinated long-term research of the bay, and direct large sums of funds to hundreds of projects. As of 2016, the Restoration Authority has restored over 77,000 acres and have 30,000 more acres in planning or construction phases. One lesson from the San Francisco Bay restoration is regenerating natural habitats and its correlated positive effects require long-term planning, funding, and political commitment for true success. The Bay is slowly coming back from hard work, political will, and an engaged (and supportive) public! We see this same implementation in Texas, as the citizens of San Antonio voted over 2 times to tax themselves for the restoration of their limestone-based aquifers.I think it is quite powerful a message when the citizens of a town find the restoration of an environmental entity so important as to tax themselves. This story is a prime example of how public opinion can really get environmental policies enacted and taken seriously. I think it’s really neat that this kind of law was able to be passed in San Francisco given the insanely high property values in that region and the therefore large economic incentive to continue wetland development. However, I also think this is a good example of what the book talks about as far as transferring the political and economic burden of environmental problems from one area to another. Besides physical draining and filling of wetlands, pollution and nutrient imbalances, especially from agricultural runoff in the case of Georgia’s wetlands, is a major disruptor of coastal wetland ecosystems. Although these runoffs are coming from upstream areas, it is the coastal communities that have to shoulder a great deal of the economic and tax burden of wetland restoration. This blog posting has a lot to do with the last chapter that we read in class. Environmental policy starts when there is enough public support. I can’t think of another way to show more support than to increase taxes on yourself to better the environment around you. What these people did is incredible and I believe that more areas like this will follow and ultimately lead to the federal government being involved. This also highlights that destruction will ultimately occur if nothing is done. Companies will do whatever is cheapest to make the most money even if its at the cost of the environment. This blog post has spoken to me on many levels! First off, growing up an hour west of St. Simon’s Island/Brunswick/Jekyll Island, GA areas, appreciation for coastal wetlands was instilled in me in a young age. Had I witnessed the events that you described within the San Francisco Bay area (such as raw sewage and dirt being dumped directly into the bay) within the coastal wetlands that I am familiar with here in Georgia- at the least, I would be extremely devastated and simultaneously enraged. For those of us who would not think twice about agreeing to tax ourselves in order to restore and conserve an environment that is precious to us, how would you suggest persuading those that would be opposed? Personally, I think that coastal communities should create mandatory educational programs that can give young students an appreciation for their surroundings by teaching them the importance of coastal ecosystems. I agree Jessica, and I would be furious myself to see that kind of disregard and disrespect. Persuading people is a challenging task… instilling in the upcoming generations that level of appreciation and responsibility towards environmental stewardship is pivotal for the future. Self-denial, I would say, is another character trait that must be encouraged in the home and in schools if citizens of the future are to fight for the greater good. As for those who currently oppose… reading the post itself, I found that the history of the ecosystem (however brief) gave me insight into the trend of change it has endured at the hands of locals. Those insights, in turn, produced a greater appreciation on the issue. I think that may have resulted from the insights preventing my mind from taking its usual course around the issue. In most issues, people can easily be blinded or deceived into thinking they know more than they do because they don’t take time to really pick apart what they are hearing or reading, or even what they think. Its very common; I have to fight that tendency myself. We skim and glaze over the topic, referring to what we already think or know rather than absorbing the information in front of us and critically analyzing it. To examine historical insights that we’ve probably never seen before shocks us and would probably undermine the prejudice our mind has in trains of thought. So providing insights that challenge the normal course of thought would, it seems, undercut the typical trains of thought people would have, making us think more concerning the issue. I’m not too sure I’m making sense with my words here though…. Basically, in most cases, it seems that publicizing the history of something gives it greater value in the minds of those who know of the something because it shocks them into realizing all that they didn’t know. Sometimes people don’t really grasp the fact that an ecosystem is fragile, that it has been there for a long time, and that the collective action of the community can make or break an area, no matter how resilient it may be. So a tactic that may be a beneficial part of any plan would be media coverage, like Chase mentions later on. Publicizing clearly the current state of things, as well as the history of the site and its role in American history, would prove effective in adding value to a site, more than likely persuading minds from opposition to support. The trick is raising up environmental advocates in the media, or who would pursue careers in the media. Maybe close ties between our college/Odum and Grady wouldn’t be so bad? Also, people resistant to change are typically huge fans of tradition and history, so playing the issue into their pet perspectives would be a clever move. The book mentioned the need for our environmental initiatives to be proactive rather than reactive. However, I think the proactive nature of the policy we see is because lots of this major environmental degradation occurred many years ago, during the infancy of environmental policy. This post notes that the Bay Area wetland destruction primarily occurred in the 60’s. The San Francisco Bay Restoration Authority, like many other initiatives, has to be reactive to counteract the lack of proactive policy in the past. I think recent policy has been much more proactive, tending towards preventing problems we can foresee with better technology and understanding of our ecosystems. While I realize there has been, and will be many more reactive initiatives as a countermeasure for past destruction, I do think we are naturally headed towards a more proactive policy style. Considering that California in today’s world is often heralded for its environmental policy, it is interesting to look into their past and read of such disregard for their environment. Our textbook points out that there is a proper role for the federal government while still delegating powers to the states, and this is clearly demonstrated here with the Clean Water Act of 1972 halting much of the damage occurring. Following this over 3 decades later with a direct democracy approach in letting the citizens decide to tax themselves or not demonstrates that the general public can care for the well-being of environmental issues. However, this scenario is partially problematic in that this action to save and restore wetlands did not occur until much of them were destroyed (and many years into the future). To clarify, it is wonderful that we can show initiative to correct our mistakes, but it seems that preventing the mistakes from even happening is still a future dream for policy in the U.S. Another interesting prospect is what significant shifts happened between the halting of the wetland destruction in 1972 and the move to tax in 2008. Clearly the public became better educated on the subject, but how do you shift opinion enough to tax themselves without destroying the ecosystem? 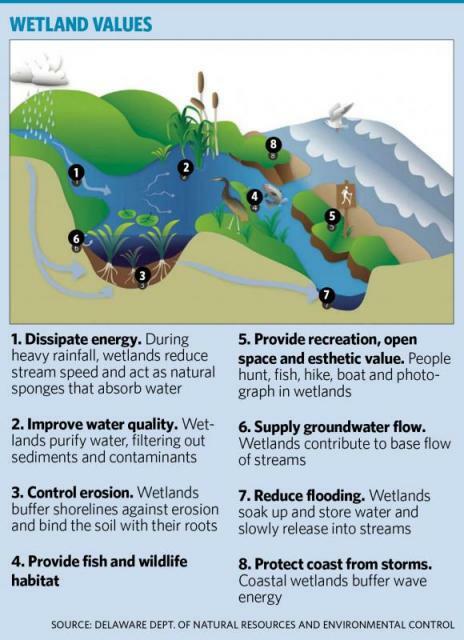 Maybe the answer to that could be utilized in preventing wetland destruction elsewhere. I really enjoyed reading this blog post! Being from New Orleans, I am very familiar with wetlands and especially the loss of wetlands. Louisiana contains about 40% of the coastal wetlands in the US and about 90% of the coastal wetland loss is in Louisiana. It is estimated that we lose one acre every 30 minutes. It is imperative for us to slow and eventually reverse this process because the wetlands are extremely valuable. Not only are they very populated ecosystems but they are also crucial in protecting coastal cities, like New Orleans, from storms and flooding. The wetlands provide a barrier between us and these storms and without it we could see coastal cities vanishing soon. I also have family in Brunswick, Ga, so I get to hear bits and pieces of opinions on environmental actions being taken to conserve the wetlands and the turtle population. While I hear of many that are for these conservation efforts, others are opposed because (in my opinion) the conversation efforts may have infringed upon their business or they have been turned off by environmental extremists. For example, I brought up turtle conservation once to my cousin and he immediately cringed, following with a comment about the “turtle nazis” who smashed out pool lights that were near the beach. In an more conservative area like Georgia, I think clear communication, appealing to local values, and not encouraging extremists events like above is a must. I could not agree with you more on the fact that the coastal wetlands habitat is a much underappreciated, yet vital part of the global ecosystem. This topic especially hits home for me because as an Environmental Consultant this summer in Savannah, Georgia, I got to experience both sides of this topic. On one hand, we permitted clients to be able to disturb wetlands, and on another hand, clients would seek mitigation for a property, restoring the wetland(usually coastal marshlands). Building off of that, this is not only a governmental venture, but also a private venture, as there is a lot of monetary value behind mitigation banks and restoring coastal marshes and tidal wetlands. In fact, coastal wetlands mitigation credits are priced higher than any other because of the value they replace in an ecosystem. I think that many people are blind to the mitigation banking industry and that if exposed, many private or public land owners may flip there land back into a natural environment. Coastal wetlands are a vital ecosystem that I feel are largely underrepresented in conservation efforts. Rarely do I hear about organizations attempting to save or restore coastal wetlands. It is refreshing to see a population take responsibility for such an ecosystem. I saw your question about Georgia. Currently, there is not an estimate about specific wetland loss in Georgia (that I could easily find). There was a great study completed by UGA researchers out on Sapelo Island that found the biomass of salt marshes declined by over 30%. (http://news.uga.edu/releases/article/satellite-data-reveal-serious-decline-in-georgia-salt-marsh-health/). In terms of the value of coastal wetlands, a decision along the way has to be decided about how to tackle increased storm surge severity. Either way, the government will either spend money on expensive levees and sea walls or incorporate natural habitats (and reap the concurrent benefits of increased water quality, wildlife, and recreation). Things to think about. Thanks for posting about this initiative, it was really interesting to learn about! I did not realize all of the benefits that coastal wetlands provide to us in addition to the large variety of species they support. I think my favorite part about this story is the progress that the Bay Area has made considering where they started from. Knowing how environmentally conscious this are is in general, it is hard to believe that less than a decade ago these wetlands were on track to being completely destroyed. I think it is really encouraging for other states who are in similar situations now to see the Bay Area as a role model for change even in a situation that may seem hopeless. Very interesting to see how the “bottom-up” initiative turned into “top-bottom” policy. It really shows how not only is California’s government very environmentally conscious, but that attitude is reflected in the everyday citizens. Maybe Georgia’s environmental rating will go up from 4 when the majority of us begin to shift our paradigm of thinking. Thank you for sharing! It is very easy to this topic to what we just read in the book. It would be great to see a similar initiative taken here in our home state. After visiting St. Simons and Jekyll Island this summer, I realized how beautiful the Georgia coast is. As mentioned by many people before, a harsh reality to face is that our coastal wetlands have been seriously neglected and degraded by past generations, and it is now going to be up to our generation of engineers to fix it. I would be very interested to see if a similar tax could be passed in Georgia. It is one thing to care about the coasts but it is taking it to another level to impose a tax on yourself that is dedicated to protecting the coastal wetlands, and I would love nothing more than to see our Georgia residents do that! This is very interesting information! It demonstrates a great cultural commitment to environmental concern which is so promising because in my opinion the cultural aspect of wanting to help is the most important part. In this instance as well, the culture encouraged authority to make political change. It’s a great example of the policy book stating that public support becomes more unified with decentralization. These are the types of news stories I’d like to see more in the general media. I believe if projects like this were more publicized instead of the rubbish that the media normally publishes, the support and awareness for environmental concerns would grow immensely. I appreciate you sharing this article with us. It provides very interesting information and puts the coastal regions in the spotlight of some of the environmental issues concerning this country. The majority of the public in our nation receives much of its information from the media. Unfortunately, most of the time is only presents problems concerning global warming, unless an immediate issue (or “trigger” event discussed in class) presents itself such as water quality in Flint, Michigan, or the oil spill in the gulf. The majority of the population doesn’t really see the problems that you listed unless they see it first hand like some have. It was great to see attention brought to the matter and to see California taking the necessary measures to protect the coast and and the bays, which is very encouraging for the future. As discussed in chapter 2 in our book, it will be great if these environmental friendly states take an influential role in leading other states to progress by the cooperation of interstate organizations. If they can set an example and show other states the benefits of such a project, maybe the other states will follow their lead. Thank you for the very intriguing read. I am always amazed to learn about how people were so okay with mistreating and polluting very delicate ecosystems in the past. It’s not much surprise that California is making very strong efforts to reverse what was done in the past, but what is a surprise is that the people are on board with it. I guess it shows that the people of California are prepared to “put their money where their mouth is” when it comes to righting a wrong that was done to this environment. This was very interesting, I liked how you started the blog it really caught my attention. This comparison reminded me of the cart we saw in chapter two about the total number of environmental policies each state has: California with 10 and Georgia with 4. I want to think that Georgia has the optional of doing something similar to this but it’s hard to compare the coast of Georgia to the Bay area, demographically they are very different. It was good to learn a more in depth explanation of state with high receptiveness to Environmental policy, takes action. As a student, I only recently learned about the importance of our coastal ecosystems, and that learning was through my own independent research. Obviously citizens of San Francisco and other cities with degrading coastal ecosystems are more informed on the importance of these issues. I think it is imperative that more opportunities are placed into our education system to give students (at all levels) the ability to learn about the importance of “under appreciated” ecosystems like the coastal wetlands. Only then may we see intense pushes for policy innovation in southeastern states that House significant coastal ecosystems, yet seem uninterested in doing anything to preserve them. The people must promote policy to get our state officials to consider E&E coastal policy as a priority. I really enjoyed this post, primarily because of the fact that my goal for the future is to work and live in a coastal environment. While most people tend to think of beaches when thinking of the coast, my mind goes directly to the wetlands and salt marshes. As you mentioned, the thing that makes coastal wetlands so special and important is the biodiversity within them. Every living organism in the coatstal wetlands is important, even the ones that people do not know about, which makes it all the more important that these areas are preserved at any cost. I hope that other states and communities will follow the path taken by the Bay Area and put an emphasis on preserving these lands, by whatever means necessary. These statistics actually make a credible argument for free-market environmentalism, since consumer wishes contradictory to financial gain are actually implemented. Quite contrary to the usual story of immediate personal gain overpowering altruism. I find it heartening that people actually care enough about the environment to take the financial hit. Of course, the incredible role coastal wetlands play cannot truly be captured by the market, but at least we show some appreciation for natural services. I will , however, piggyback off of another comment that property values off San Francisco are high. While I wholeheartedly agree that it is impressive that they curtail development of such financially valuable land, I also have to wonder if maybe the citizens’ relative affluence is what enabled them to sacrifice the potential monetary gains. Historically, blue-collar workers have had their livelihoods directly dependent on dirty industry. Wealth affords the chance to be generous. I remember reading a case study of Pennsylvania tracking; as our text pointed out, the state embraced fracking wholeheartedly. One local politician’s justification was that it completely revitalized a dying area, and that they needed the economic boost. It’s interesting to consider that as a privileged college student.